Last weekend during our trip to Hanging Rock State Park, Finn shed his socks and shoes and waded out into the chilly waterfall stream in search of rocks. Rocks have been prominent in his life lately with Elizabeth's study of rocks and landforms in school, and her renewed interest in collecting rocks. 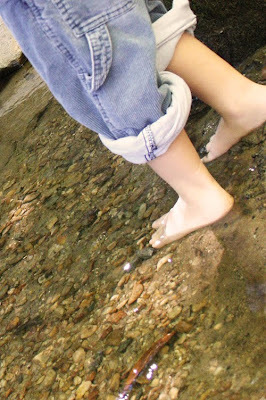 When wading into the stream, Finn immediately began identifying rocks that "Sissa" would like and a couple of rocks he'd like to put in his basket for himself. 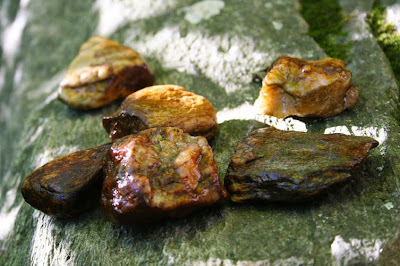 When I asked him if he'd like to bring some rocks home to make "soft rocks", his term for felted rocks, his face lit up. We have a few felted rocks that we made on our vacation to the mountains last summer. Finn was napping during our last rock felting session so he was delighted to be able to make his own "soft rocks". We set our rocks out to dry after rinsing them thoroughly, no need to felt mud in there as well, then carried them home to cover them in soft felt. We decided to try to find some felt that would match the autumnal leaves and uncovered a few scraps in my stash that fit the bill. I found some naturally-dyed yellow and brick red from Colors of Nature that while they needle-felt beautifully, the color apparently runs during wet-felting. Good to know! 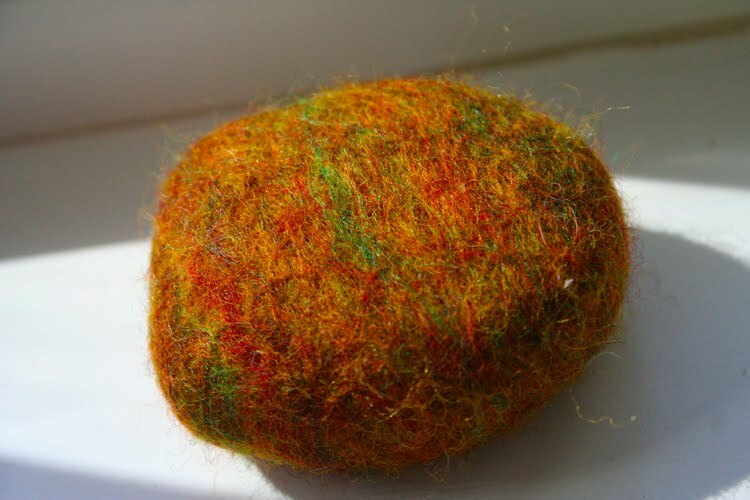 I also found a autumnal multicolor wool that made a very sweet felted rock. I started off by wrapping the rocks with thin layers of wool going different directions until there were at least 2 layers of wool in each direction. This is important so that the wool doesn't slide too much causing a thin spot or hole exposing the rock. Then I needlefelted the wool very loosely just to make it stay together when dipped into the water. After gathering our dish soap and a bowl of warm water, we dipped our rock in the water and squirted a generous amount of soap onto the wool to lather and help the wool fibers lock together into felt. 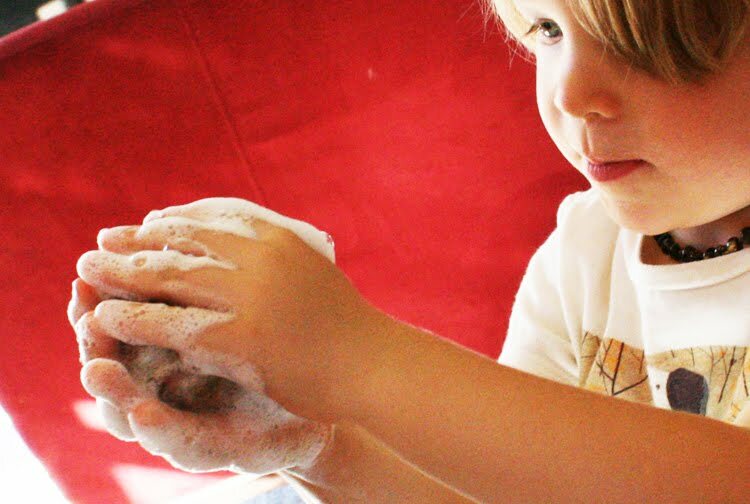 Then Finn and I passed the wool-covered rock back and forth between us, each rubbing and scrubbing the wool for a minute or two. We would say, "may I please have a turn?" and "would you like a turn?" each time we passed. What a fun game to collaborate on wet felting while practicing our manners! Our finished product is now sitting in the window sill catching the warmth of the sun. Finn can proudly tell you which rock we finished first, second, and third and which rock he's claimed as his own. He has traced them on paper, played hide and seek with them, carted them in his dump truck and used them for mountains for his animals. What imagination and creativity from just a piece of rock covered in a bit of wool! Rockstacking becomes a new challenge when soft fluffy wool interferes. The balance is quite different this way! Oh, that is so neat! I love it. I am gonna have to get me some wool! Gorgeous!! We tried to do this today and it was not a success! I could not get the felt to stay wrapped around the stones. I tried needle felting it some too. Maybe I needed to make the layers thicker. 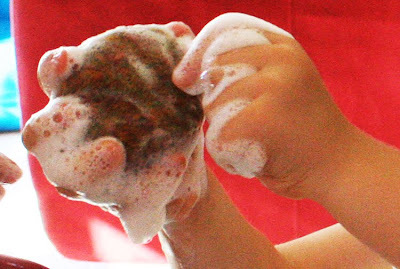 No matter... the girls had fun playing in the soapy water making a bracelet and floating leaf boats! We'll try again. I just love this idea and how beautifully yours turned out. 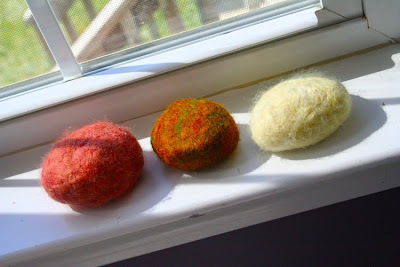 We made felted rocks this week as well! When I post my pictures, I will be linking to your directions for sure! Needle felting a bit before starting the wet felting part was very smart, and would have saved me some frustrated children! I never thought of doing rocks, what a cool ideas! They look fabulous! I think I might put a felting work in the classroom! I love that last pic of them all stacked together! This post reminded me that ive been meaning to get some rocks from the beach. 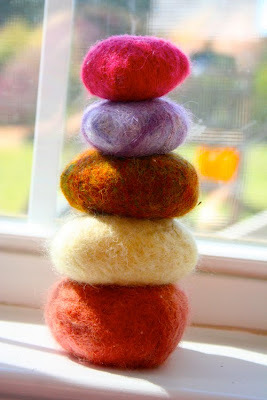 Once I do I dont think ill be able to resist felting them after seing these! the rocks are BEAUTIFUL!! 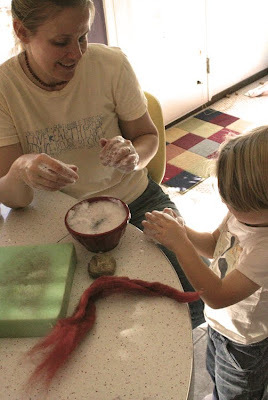 working with wool/felt is really something special with children. This is fantastic!! People think I'm so creative...they have no idea what creative can be. I feel like a fraud!! ;-) What a fun and unique project, it looks like Finn had a ball (or...a rock?? LOL). 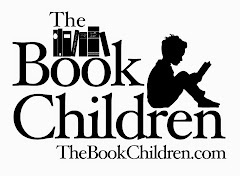 What a great project! Wow. Thanks for sharing. They really are beautiful! I can't wait to have an afternoon at home so I can try this with Ruby! These rocks are gorgeous - my son would absolutely adore these - thank you for the tutorial!